In order to know what great love is, one should study the beautiful penitent, who washed the feet of Jesus with the water of her tears, and dried them with the towel of her hair. Saint Mary Magdalen’s audacity, her courage, her eagerness, gave Christian love a true impetus in all the saints that followed her. She was an outstanding girl, the love-flamings of whose heart, the love-anguishings of whose soul, consoled Our Lord when He needed comfort most ­ when His feet were pierced by nails, His head by thorns, and His heart by man’s ingratitude. God would gladly make the world for the love one girl can give. Our Blessed Lady is God’s perfect maiden. But next to Our Lady, Saint Mary Magdalen is the girl in the life of Our Lord whom He most loved. She was His overwhelming favorite, because her love was the kind that never counts the costs. Her bright eyes were always full of tears ­ for Jesus alive and sitting at a feast, for Jesus dead and laid in a tomb. How Saint Mary Magdalen first met Jesus, we are told in the Gospel of Saint Luke. Saint Mary Magdalen learned that Jesus was dining, one night, at the house of Simon, a Pharisee, and without waiting for an invitation or an introduction of any kind, she burst through the guests to get to Him. Her only thought was to show Jesus how thorough her love had made her sorrow and her repentance, for Mary Magdalen, the daughter of a rich and noble family, was reputed a great sinner. Never once did she think of the reproaches and rebukes which the Jews would heap upon her, in the house of a Pharisee. The Pharisees believed that all sinners remained sinners; they believed that all except themselves were sinners. Unmindful of their scorn, Saint Mary Magdalen knelt behind Our Lord while He was seated in this house full of bearded misogynists, and washed His feet with her tears and dried them with her hair. And, kissing His feet, she anointed them with precious ointment. Tears and kisses, the highest priced oils that money could buy, and hair which was her crown ­ these were her substitutes for words. And they were a thousand times more eloquent. When Simon, the Pharisee who had invited Jesus to dinner, complained within himself saying: “This man, if He were a prophet, would surely know who and what manner of woman this is that toucheth Him, that she is a sinner,” Our Lord quickly defended Saint Mary Magdalen. Saint Mary Magdalen is the queen of penitents. Her special title is Penitent . That is the way she is referred to in the Church’s liturgy, and that is the way we lovingly remember her. And so beautiful is penitence in the eyes of God, that He is willing to have this girl ­ who loved Him with every breath of her being, and whom He loved with a most special tender love ­ known throughout all the Christian ages by a word which reveals afresh, for every new generation, the story of her sins. Men and women, whose own lives should cause them to hang their heads before the beauty of her love and dedication, know only her shame and the casting out from her of seven devils. And they think her akin to themselves, in some familiar way. What so few realize is that Saint Mary Magadalen, because her gratitude and humility are equal to her unparalleled love, is delighted to bear, through all Christian centuries, the title Penitent in order that through her the mercies of her Lord might be made manifest. For actually, in all the days of her life that followed upon her anointing the feet of Jesus in the house of Simon, the Pharisee, she grew in love and prayer and contemplation to such a height that, except for Our Lady’s ­ whose life transcends in holiness that of the lives of all the saints together ­ Saint Mary Magdalen’s life may be said to be the holiest of all the holiest women in the Church. So complete and whole, so lacking in human respect, were her recognition of Jesus, her instant and overpowering love for Him ­ and her sorrow for her sins in the light of that realization and love ­ that Jesus took no pains to conceal His joy in her. She, the sinner, would match her love with His by giving her all. He would pour Himself out in love for man. She would pour herself out in love for God. After her meeting with Jesus in the house of Simon, the Pharisee, Saint Mary Magdalen gave herself up entirely to the service of her Lord.She became one of the holy women who followed Jesus in His travels in Galilee, and up to Jerusalem. For two years she accompanied Him, listening to Him preach, drinking in His words of eternal life, and ministering to Him and his Apostles. Saint Mary Magdalen anointed Our Lord’s feet a second time, and in the house of another Simon, this time Simon the Leper. His house was very near her own, in the little village of Bethany, where she lived with Martha, her sister, and Lazarus, her brother, whom Jesus had raised from the dead. This time, Saint Mary Magdalen’s anointing was in order to comfort the body that was soon to be hung on the Cross for the redemption and salvation of the world. It was six days before the Passion, and it was the sabbath. A dinner had been prepared in the house of Simon to honor Jesus, and Martha was serving. Lazarus was seated among the guests at the table. Mary took the precious ointment which she had brought in an alabaster box, and poured it on the head which was soon to be crowned with thorns. She wiped with her hair the dust from the poor feet which were soon to be pierced with nails, and anointing them, she kissed them. And the house was filled with the odor of the ointment. Judas Iscariot, the Apostle who was about to betray Jesus, cried out in anger against Saint Mary Magdalen. “Why was not this ointment sold for three hundred pence, and given to the poor?” he asked. Saint John tells us that Judas said this, not because he cared for the poor, but because he was a thief, and having the purse, he had also the money which the purse contained. Saint Mary Magdalen followed Jesus through each step of His cruel Passion. She was at His side at every possible moment on the road to Calvary, and she seemed not even to hear the fierce anger of the Jews as she broke through the guard of the soldiers to minister to Him whenever she could. She would have given her life a hundred times over in exchange for His, or even to spare Him one second of torture! She stood by the Cross of Jesus, with Mary, His Mother, and Mary of Cleophas, and John the Beloved Disciple. She stood for three hours, and His blood fell, drop by drop, on her hair. And His death was her martyrdom. She followed Him to His grave, and she wept all through Good Friday night and all the next day, because it was the festival of the Pasch and she was forbidden to go out to Him, to stay by His tomb. At sunset on Holy Saturday, when the Pasch was over, she hastened to buy spices with which to anoint His body, and very early on Sunday morning, before it was light, she set out, with the other holy women, for His sepulchre. They reached the tomb of Jesus just as the sun rose. Saint Peter and Saint John set off in great haste to the sepulchre. Saint John, being younger and on fire with his love for Jesus, soon outdistanced Peter. But he waited at the tomb, so that Peter might be the first to enter, because the Apostles were already filled with the consciousness that Peter was their head. Saint Peter went into the sepulchre, and Saint John after him, and they beheld the linen cloths with which the body of Jesus had been wrapped, lying there, and the napkin which had bound His sacred head, placed apart from the other linens. And they doubted no longer what Saint Mary Magdalen had told them. They returned, wondering greatly, to bring the news to all the Apostles. But Saint Mary Magdalen would not be drawn away from the sepulchre. If the Resurrection had been delayed thirty years instead of three days, her golden hair would have turned to gray, the ointment bought for the precious body of Jesus would have dried up, and its bearer would have become an old, desiccated lady in place of a brilliant young girl; but she would have gone on weeping and waiting beside that tomb. Now, as she stood there weeping for Jesus, she stooped down and looked once again into the sepulchre. And she saw two angels in white, sitting, one at the head, and one at the feet, where the body of Jesus had been laid. But the brightness of the garments, and the way an angel can illuminate himself in flesh so as to dazzle one’s eyes, could not take from Saint Mary Magalen the remembrance of the poor face of Jesus, covered with spittle and blood. Love has a way of clinging to where it has most given itself. Saint Mary Magdalen had given her love whole and entire to Jesus from the first moment she saw Him; but on Calvary ­ when He raised His tired, spent and anguished eyes to Heaven and said to His Father, “Father, into Thy hands I commend My spirit” ­ the heart of Saint Mary Magdalen broke. And, except that she did not die, she gave up her life; for life could never again have any interest or joy, or even any further sorrow, to offer her. From that moment on Calvary, Saint Mary Magdalen was given to what was beyond the earth, to the Jesus who had gone from her, as she believed, into eternity. She was to be henceforth crucified to the world, in which she must live without Him. And nothing, not even an angel, could distract her from that which she sought, and which was all that was left to her: the bruised, wounded and dead body of her Lord. “Woman, why weepest thou?” one of the angels asked her. “Because they have taken away my Lord, and I know not where they have laid Him,” she answered. When she had said this, she turned back, and beheld Jesus, standing beside her. But she did not know it was Jesus. And immediately she knew it was He. For all love’s signals are simple, and its recognitions instantaneous. Joy, such as she had thought never to experience again on earth, filled her. Happiness flooded her soul. Inexpressibly glad relief revivified her poor, stricken body, and trembled in her voice. “Master!” she answered Him. And she fell down on her knees before Him. Saint Mary Magadalen was the morning-star of Christ’s Resurrection. 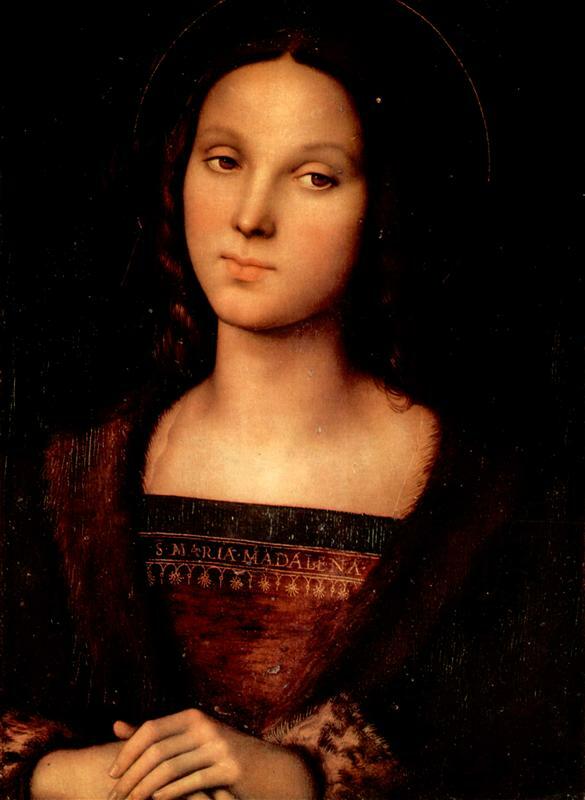 Saint Mary Magdalen, with the other holy women who had followed Him during His public life, saw Jesus several times during the forty days He remained on earth after His resurrection. She was present at His Ascension into Heaven, and accompanied Our Lady when she and the Apostles and disciples “adoring, went back into Jerusalem with great joy” after the Ascension. Saint Luke tells us that Jesus led His followers, “out as far as Bethany: and lifting His hands, He blessed them. And it came to pass, whilst He blessed them, he departed from them and was carried up to Heaven.” Bethany, the village where Saint Mary Magdalen’s family lived, was close to the Mount of Olives, from which Jesus ascended into Heaven. The Doctors of the Church tell us that Jesus led His chosen ones to Bethany so that He might say farewell to Lazarus and his sister, and to bring them with Him to Mount Olivet, in order that they might witness His Ascension, and share in His triumph. The sister which the Doctors mention was, of course, Saint Martha, since Saint Mary Magdalen would have been in Jerusalem with Our Lady and the holy women, as was her wont. Saint Mary Magdalen was present in the Cenacle, “persevering with one mind in prayer, with the women and Mary the Mother of Jesus, and with His brethren,” for all the days until Pentecost, when the Holy Spirit came down upon them all. We are told that it was Saint Maximim, one of the seventy-two disciples of Our Lord, who baptized Saint Mary Magdalen and her family. This beautiful girl, who had bathed the feet of Jesus with her tears of perfect love and contrition, and to whom Jesus had said, “Thy sins are forgiven thee,” had to have water poured on her head, so as to receive the Sacrament of Salvation ­ as well as the other Sacraments ­ whose absolute necessity was preached to the world on the day of Pentecost, and all the days following it. Fourteen years after Our Lord’s death, during a persecution of the Christians by the Jews in Palestine, Lazarus, with his sisters, Mary Magdalen and Martha, their serving-maid, Sara, the two Marys ­ one the mother of James the Less, and the other, Mary Salome, the mother of James the Greater and John the Beloved Disciple; Sidonius, the man blind from birth who had been cured by Our Lord, and Maximin, the disciple, were obliged to flee for their lives in a boat which had no sails or oars. Only by the power of God did the boat survive and finally drift to the mouth of the Rhone River, in France, at what is now called les Saintes-Maries-de-la-Mer . The two Marys and Sara settled there. Saint Lazarus chose Marseilles for his apostolate, and he became its first bishop. Those early French Christians were proud indeed to have as their bishop, the holy man whom Our Lord had raised from the dead. Saint Martha, after having endeared herself to the people of Marseilles by her holiness and charity, withdrew to Tarascon, where she founded a convent and lived to a very old age, renowned for her miracles and her great sanctity. Saint Maximin went to Aix, and became the venerated Bishop of Aix. The blessed Marie Magdalene, desirous of sovereign contemplation, sought a right sharp desert, and took a place which was ordained by the angel of God, and abode there by the space of thirty years without knowledge of anybody. In which place she had no comfort of running water, no solace of trees, nor herbs. And that was because our Redeemer did to show it openly, that He had ordained for her refection celestial, and no bodily meats. And every day, at every hour canonical, she was lifted up in the air by the angels, and heard the glorious song of the heavenly companies with her bodily ears. Of which she was fed and filled with right sweet meats, and then was brought again by the angels unto her proper place, in such wise as she had no need of corporal nourishing. And so Our Lord’s prophecy concerning Saint Mary Magdalen, made long years before to Saint Martha at their home in Bethany, was fulfilled. In Heaven, we may be sure, Saint Mary Magdalen is where she most loved to be on earth ­ at the feet of Jesus. And we can ask her, the dear queen of penitents, to give Him from our possessions what is the equivalent of our tears and kisses and hair, and all the precious ointment of our love. And we beseech her to implore Him to give us the best part, and that it may never be taken away from us.